Instead of cancelling Luke Cage, how about just hire better writers? 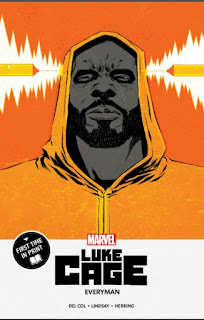 Like this brand new Luke Cage story, "Everyman". It's from the writer of "Kill Shakespeare" Anthony Del Col. It's release date is November 21st. I've read it. It's a wicked good story. Luke tracks down a serial killer in the midst of Harlem’s worst-ever heatwave, one killing the community’s richest people. And on top of that, Luke is diagnosed with CTE from the years of internal trauma he’s suffered. Serial Killers. Heatwaves. Luke with CTE!!! You can't ask for more. A GOOD story line. Cute kids. A decent Iron Fist!!! I know right? After that debacle that you, Netflix, gave us. This is what Danny Rand is supposed to be like! And my favourite part? Luke and Jessica stay together!!! So for all you Luke Cage fans out there, go pick up Everyman on November 21st. You'll be happy you did!